- Following my overseas adventure I had to update my address details with NS&I. This is quite a clunky process and takes a few days as it can’t be done via internet or telephone. Instead I had to send off a signed letter requesting my details be changed which took a few days for them to process. - I had to transfer the funds from my online savings account into my current account which takes the usual 3 days. I still can’t believe that in 2011 it takes 3 days to move money electronically. In fact, yes I can, because we all know that this limbo period is where the banks hold on to your money and not pay you interest on it. A nice little earner I’m sure. What was also interesting was that my online savings account provider very quickly sent me a survey saying that I had recently moved a large sum of money from my account and they would like to understand why. I’m amazed that they have gone to the trouble of paying somebody to set up a survey. Surely the answer is always going to be because “I want to buy something” or “your rates are uncompetitive”. Funnily enough they didn’t have an option that said “moving money from poor insulting interest rate to NS&I”. So once that was all sorted out I tried to buy online but for some reason the website no longer likes my postcode even though I have bought many Index Linked Savings Certificates in the past. So it was on to the phone and I can say they either don’t have enough staff or this issue of ILSC’s are proving extremely popular. It took me a long time to get through but once I was finally speaking to a human it took about 2 minutes and the certificate arrived in the post a few days later. So the back end of their process is efficient. I’m now starting to think about whether these certificates are going to cause the banks to up their game a little and maybe start paying savers a more sensible rate. As Monevator rightly pointed out the UK government in 2011 is trying to borrow £2 billion through NS&I. What’s interesting is that NS&I estimate that to get that £2 billion they actually need inflows of some £14 billion. Now of course we don’t know how much of that £2 billion is coming from Index Linked Savings Certificates but given that in 2010/11 they only raised £300 million it’s not too much of a leap of faith to suggest a large majority is coming from Savings Certificates which includes both Index-linked Savings Certificates and Fixed Interest Savings Certificates. NS&I freely acknowledge that they withdraw Savings Certificates “from general sale in July 2010 due to exceptional demand which risked NS&I exceeding its Net Financing range for 2010-11”. Running a quick extrapolation of £300 million versus £2 billion suggests that last year inflows may have been around £2 billion. That means that there is new competition in the market trying to acquire an additional £12 billion. Where is that going to come from? Again it’s only theory, but I’d suggest that the majority will be money that would have otherwise ended up in bank accounts. It certainly is in my case. Where would your ILSC money have ended up if they weren’t available? Let’s run a straw poll. With this in mind supply and demand should suggest that the banks should need to start offering a more competitive deal if they want to keep our money. I’m therefore going to revive my chart that shows the average rate on savings accounts to see if any effect can be seen over the coming months. Of course it’s too early to see anything yet but today sets the benchmark rates to track from here. Firstly, the red line which is defined by the Bank of England as the monthly average of UK resident banks sterling weighted average interest rate, interest bearing sight deposits from households not seasonally adjusted. As with previous reviews of this data set I’m interpreting that as current accounts and instant access savings accounts. The average rate being paid as of April 2011 is 0.92%. At this rate the 40% tax payer ends up with a real return of 0.55% and a 20% tax payer 0.74%. It’s derisory compared to current returns from NS&I Index Linked Savings Certificates. 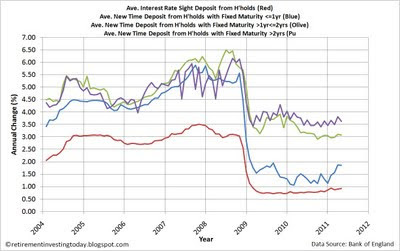 If we then look at time deposits we have the blue line which is the monthly average of UK resident banks sterling weighted average interest rates for new time deposits with a fixed original maturity of <=1 year from households not seasonally adjusted which today is giving 1.86%. 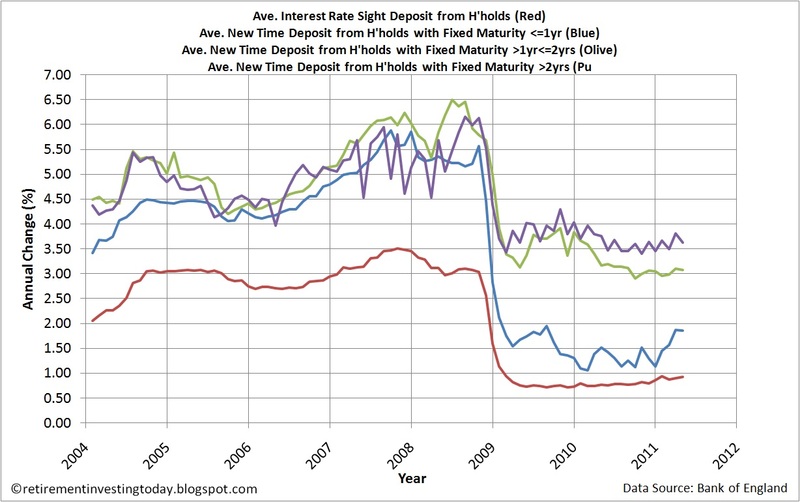 Similarly, the olive line is the same but for >1 year but <= 2 years and is achieving 3.08%. Finally the purple line is >2 years and is today achieving 3.62%. It will be interesting to see if some new competition can force the banks hands. Of course there are a multitude of other effects which could cause interest rates to rise as well but let’s discuss those as they occur. 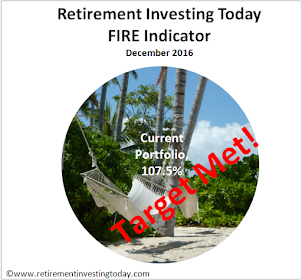 So where do I sit today with the low risk portion of my Retirement Investing Today portfolio. Well NS&I are well in front with 21.2% of my assets compared to the banks who now only hold 9.2%. >Where would your ILSC money have ended up if they weren’t available? 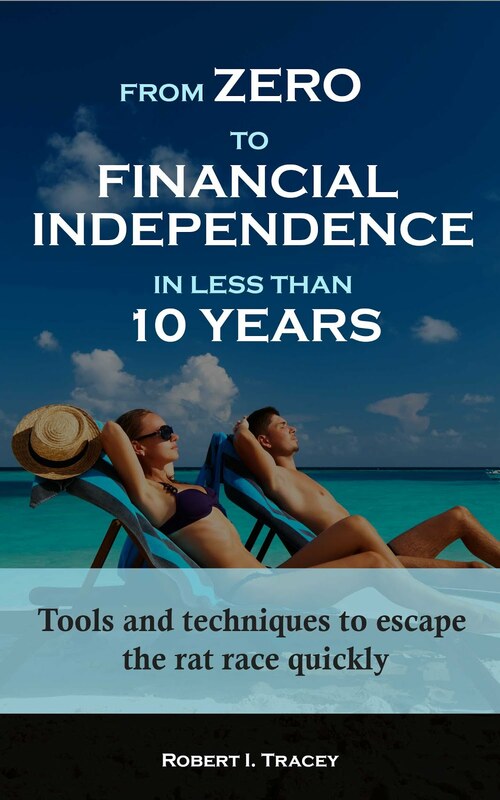 I withdrew money, which was on instant access at 2.5%, from my EF. But as ermine says you can regard an ILSC as an EF if you want to. Probably, instant access will be a better bet than RPI+0.5% in 5 years time (and the banks will cease to moan), but the crossover point may be a while off yet. Yikes, I must admit I didn't consider the relationship between NS&I certificate issuance and how much the government needs to borrow. Quite an oversight on the face of it, and you could be right that there will be more of this money up for grabs than originally seemed the case. Mine came from a nationwide account paying a paltry amount of interest, plus the liquidation of a Commerzbank account because a) the euro was doing okay relative to the £ and b) the Greeks are going down, and they'll take Commerzbank with it when they go. I am still a bit puzzled as to why the government is being so nice to us. It's not an election year :). I don't think the HMG needs to borrow like this and Gilts, I recall, typically soak up around 80% of debt issuance. I suppose it will be similarly cheap, though, maybe around 3-4% p.a. over the five years. Maybe it's a way of putting pressure on the banks? So our straw pole of 4 reveals all funds have come from bank savings accounts. Now we multiple that up to £14 billion and let's see if the banks notice. I agree with Ermine. I see no reason why they can't be part of your emergency fund providing you allow for the time it would take you to retrieve your funds from NS&I. I'm guessing this could take a couple of weeks by the time you filled in a form, posted it to NS&I, it was processed and then your money was returned to you. Yikes is right. When I thought about your post of £2billion I didn't think the banks would even blink however at £14billion it becomes a little more significant. When the Greeks "default" in whatever manner is finally decided by the powers that be I fear it will take more than Commerzbank with it. So just to confirm, have you guys had letters? Did you all apply entirely online? Getting a bit nervy now, but it sounds like it's pointless calling the hotline unless you've an hour free. Just emptying a bank account that was paying a quite spectacular 0.5% interest. So another £1500 (I know not much, but all I can afford) is going into the NSandI from a bank account. As I mentioned I ended up buying them over the telephone. From the date of my call I had the certificate in my hands within about 3 days. Have you bought any before? I've made plenty of purchases in the years prior which might ease the process as they already have my signature etc. Hope that helps. You have to start somewhere. How does the saying go - "every little helps". Always remember the miracle of compound interest. A little bit continuously over a lot of years ends up being a big number. @Monevator - I applied online and got my blue certificate in about a week ISTR. I then had another go the same night with a different debit card and that cert came a day later. I didn't have the grief either you or RIT had. Maybe it helped that I have some of last year's too. Are you pulling any other troops back or just this allocation from Commerzbank to NS&I? I want the Greeks to hurry up, default and get it over with. Some kinds of crap only get worse the longer you defer them, and this is one of them. At the moment we can see nothing and do nothing because of all the hidden liabilities bunging up the works. This has to get a lot worse before it gets better! Invested in my certificates today. Money came out of our Nationwide "e-savings plus" (what an awful name) account. My other half will be doing the same soon, so a big outflow from Nationwide for us. So that's another one removing money from the banks. It's going to be interesting to watch over the coming months whether this new NS&I competition forces the banks to respond and raise interest rates for savers. No doubt if the Banks/Building Societies see too much of an outflow. They will just threaten to stop loaning money to the punters if the NS&I don't fall back into line.